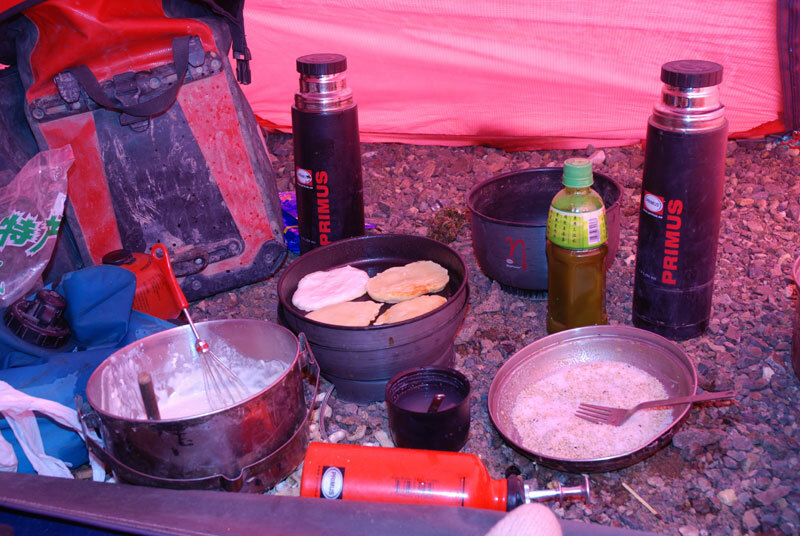 Food is a really important factor during strenuous expeditions. Many big expeditions have failed due to too little or wrong kind of food. Thus we gave special attention to food plan. Especially for those four weeks that we spent far away from any opportunities to stock up on supplies, we had thoroughly composed food rations for each day. 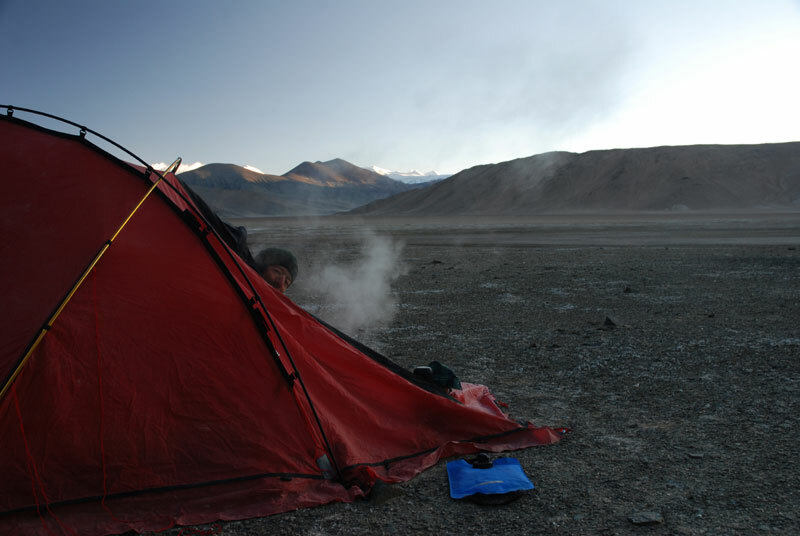 In addition we adjusted our diet to high altitude, especially in the acclimation phase. The smaller settlements we passed in the beginning of the expedition allowed to stock up on basic foods such as pasta, rice, sugar, flour. Later, we had to be totally self contained. 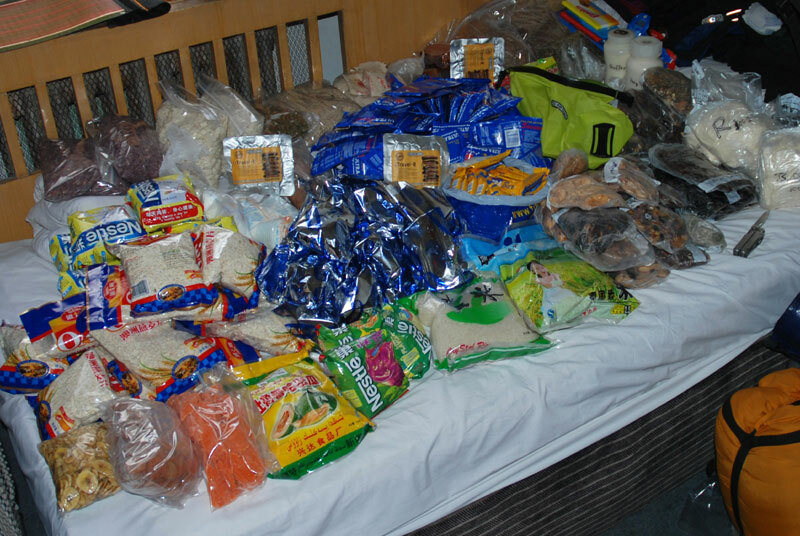 Special food carried from Germany or bought in Kashi. Sirengou: Last opportunity to buy 5 kg of noodles. 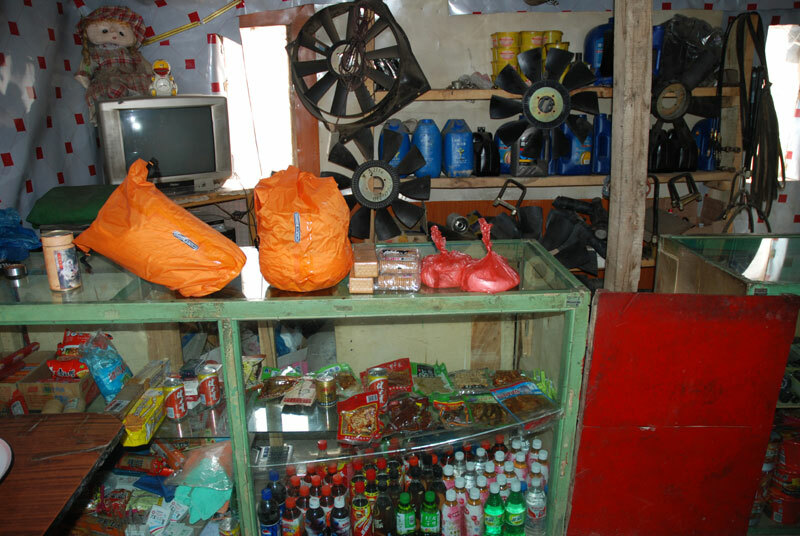 The product range of the small store in Sirengou. 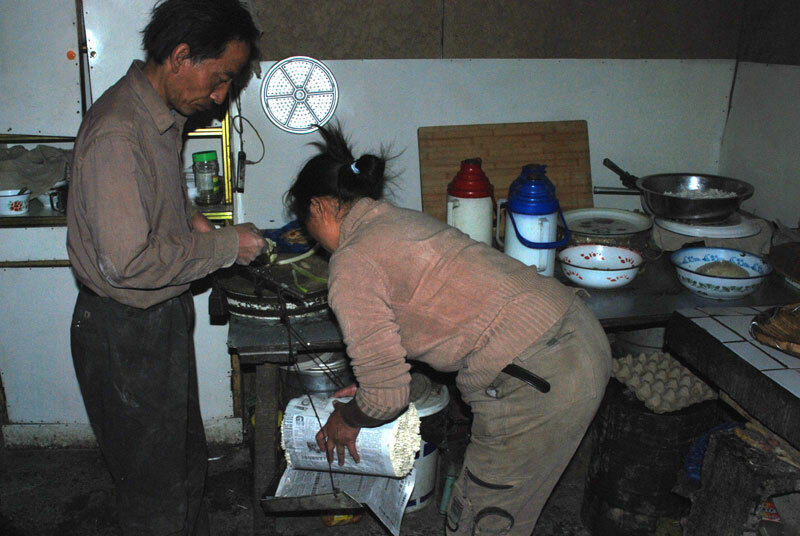 To keep the volume small but nutritional value high, and to still maintain the pleasure of eating real food , we prepare our own Epedition Food: We have a stock of dehydrated vegetables, dehydrated fruits and fruit leather, dehydrated eggs, dried meat, and Pemmikan. These things we carried with us from Germany. Staple food (noodles, rice, cereals, milk powder, sugar, flour) was taken on along the way as needed, and some typical regional things (nuts, dried melon, raisins) we bought in Kashi. Dinner: rice with vegetables and cream sauce (milk powder). Steam from cooking is visible in the cold morning air. From flour we made delicious things, such as pancakes. In addition, we used food supplements: We added a vitamin and mineral powder (UltraBuffer) to our drinking bottles during the day, and a similar kind of powder helped regeneration of muscles and immune system at night (UltraRefresher). During the mid-day break for us it turned out to be optimal to drink a "drinkmeal" (UltraStarter) and eat energy bars (UltraBar) and dried fruit with it. 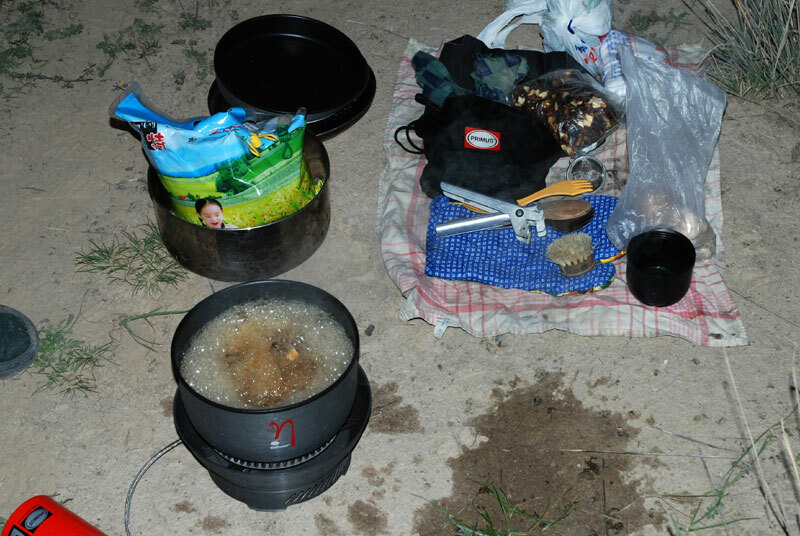 Three factors are important for success of an expedition: Good planning, robuts gear, and the right kind of food. A long known fact from many alpine and polar expeditions in the past is: "If food is good and enough, there will be less tensions in the group".